I'd love a hot dinner for every time I have heard that question! We almost feel as if the enquirer will be heartily satisfied if we tell them to took six months of hard labour to complete a painting, and that anything less might have them thinking it's unworthy of attention. I know from experience that onlookers are almost in disbelief that an artist can produce three or four paintings in a few hours while painting plien air (outdoors). The general consensus is , that paintings take days, weeks or even months to finish. Of course, some paintings do take that long but it depends on size and the amount of small-brush detail, but it's not a general rule. Many artists can paint several good works in a day, but does that make them any less valuable than one that has taken days or weeks to paint? Paintings that take longer to complete are not necessarily better or of more value because of it. Artists are not just worth an hourly rate like a plumber or even a lawyer. Bear in mind too, that good artists are harder to find than a good lawyer or doctor. For a lot of professional and semi-professional artists, output is important and under normal circumstances a painting every month or so just isn't going to keep you in bread and jam, unless you are selling them for tens of thousands each. Speed and continuous output is a great advantage. An artist who can complete a work in hours, is able to do so because of accumulated skill and confidence in their whole process, including colour mixing, drawing, application of paint and knowing when to stop. Artists should not be phased by the question - "how long did it take to paint that". Often, it’s just an expression of interest by a passerby with no intent. If the question is asked we can truly answer by adding the number of years of experience we have had - "it took me 20 years to learn how to paint this in three hours". 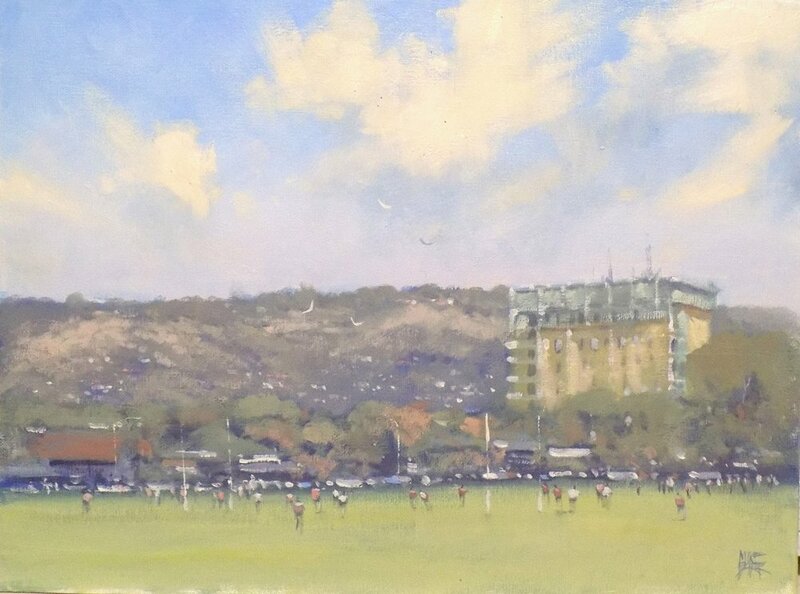 Caption: This plein air painting of Victor Park Adelaide, was completed in about an hour and a half. As you look at it you can see everything was put down without too much fuss and the figures are nothing more than a few strokes. It takes time and practice to do this with some success.